Hi, Joel. I knew raiding with you in this build will be a pleasure and it's very safe: it looks like you manage always to find the best route . And yes, welcome to the alchemist's club! The complete lack of hobby shops in Sint Maarten led me to bubbling experiments (mostly failed). My "emergency" primer (tested and trusted in this case) is Rust-oleum enamel. I have always white and black in both satin and gloss and I mix the gray tone I need with the less part in satin. It has a very good grip and sands well. I'm not so sure I'm finding the best route to do things, but rather trying to convert my military modeling to where it works with cars and gloss finishes. 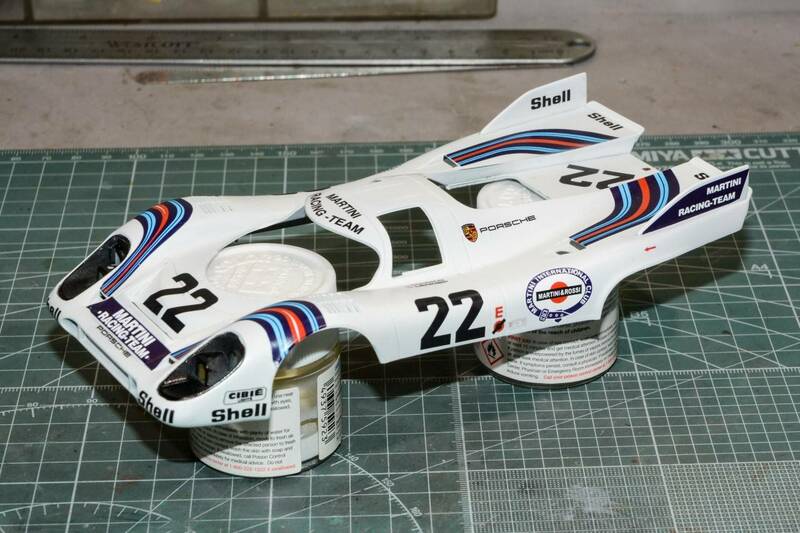 I do find that 1/24+ scales are a lot easier to work with and in then 1/48 scale. So of course my next aircraft model will be a 1/72 scale multi prop. I usually shoot all my pictures in RAW format, but these I took in JPEG with the hope that I didn't have to do much enhancing in Lightroom 6.1. All the pictures needed a +.5 in exposure and +24 in contrast. That's it other then a little cropping and leveling. Like I said, I wasn't very happy with the super thinned primer from MCW, and my copycat version just wasn't comfortable to work with. I've ordered Mr. Hobby (Gunze) 1,000 Primer Sealer that I'll thin with Mr. Color (Gunze) Leveling thinner, but no where as thin. Hopefully that will solve a lot of my problems and issues. From my google searches and U tube videos, Rustoleum and Duplicolor primers a super popular with the car guys. I'm willing to bet that the Tamiya rattle can Lacquer primers would work well too, but they're expensive. Tomorrow I'm going to be shooting the color coats. I'm both looking forward to it, and leery of it at the same time. Really coming along fine there Joel. Excellent detail work. Thanks so much for those most kind words. It's much appreciated. I keep my fingers crossed. I know it's the most daunting task in this build. Myself I consider the white finish as the graduation certificate for the auto modeler I even intended to propose a group build on the subject (or a challenge). those little custom touches are working out great! Sorry that I missed your post. Glad that you like my efforts to date. Thanks buddy for being in my corner when I really need the support. Richard. Great to have you along for the ride. This one is sure bumpier then my usual Aircraft builds. But there has to be a 1st time for everything new that one tries. Agreed. Primer is like the course of huge meal. Just hope that the "Chief" is up to the task on this one. 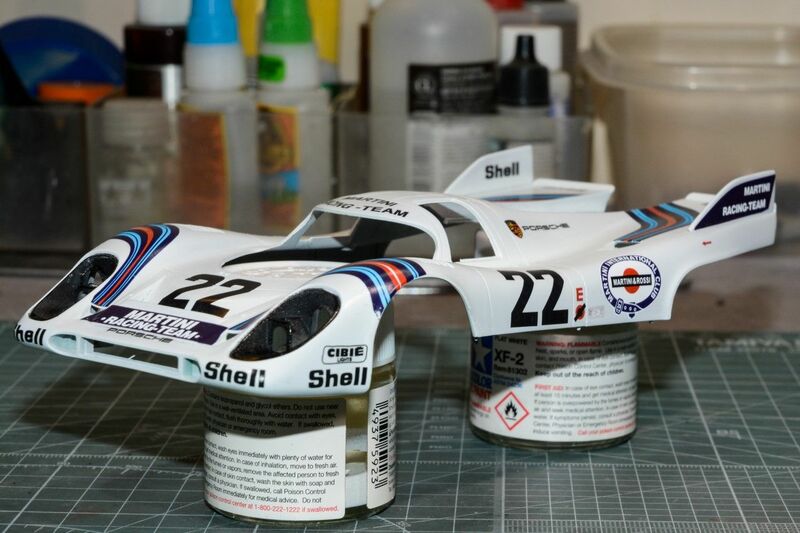 Yesterday I Air Brushed the shell and chassis MCW Martini White. The paint, like their primer is already pre-thinned to what they said is 125% automotive Lacquer thinner to automotive Lacquer paint. Now I've never done this before, so I watched a good dozen videos of build blogs I've been following, and everyone has their own technique and style. Well, everyone but me that is. Since the paint is so THIN, I went with a 14-16 flow psi. The biggest issue was how much to I open up for the paint flow. I decided to go with the two mist coats exactly as I would for a aircraft model giving 5 mins drying time between coats. For the 1st wet color coat, I started to open up the paint valve till I could get a wet look, but it's so easy to go to slow and get some rippling, so I made sure I did full passes at a decent rate. 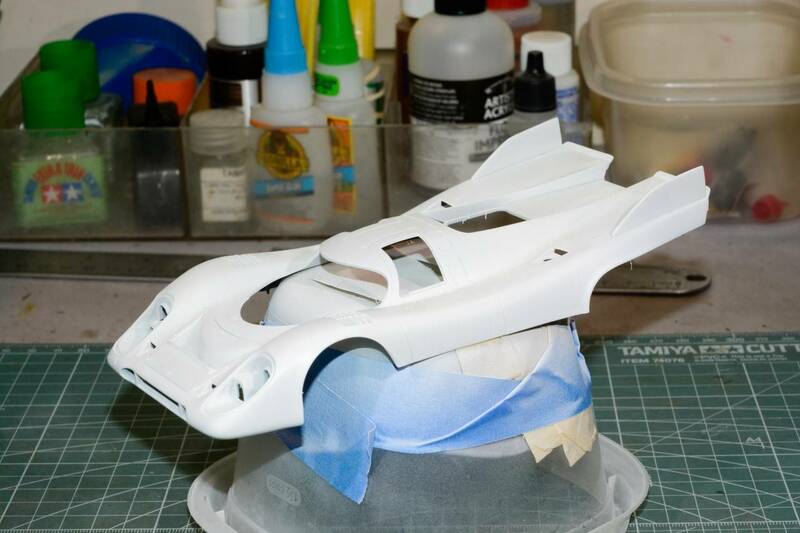 I ended up doing 4 wet coats, but they weren't really wet enough after I looked at the shell and chassis. I wasn't to happy with the results. Not smooth enough to the touch, some uneven areas, and more damn dust and a cat hair or two. I guess I have to clean the paint booth prior to using it. Gave it a hour or so to dry in my paint bin, then gave it a good, close inspection. Looked better now, but it still needs some wet sanding. So today I wet sanded it with Tamiya 3,000 sponge. After wetting the shell and chassis I put a drop of Dawn dishwashing liquid in each area as I worked it to further protect the paint. I slowly worked my way around till I sanded every section. Then a wash with warm water. To say I was amazed at the difference would be an understatement. Smooth, and consistent with a slight shine. So now comes the big question. Do I clear gloss then decal, or just decal directly on the smooth surface? Hi, Joel! I'm glad you achieved the desired result eventually. If would be me, I'll apply the decals directly to smooth paint, avoiding that extra coat of cleat that can be troublesome. That finish looks superb Joel! Certainly worth all the extra work required. I have never been one for clear coating prior to decaling except on my last build I gave it a go. 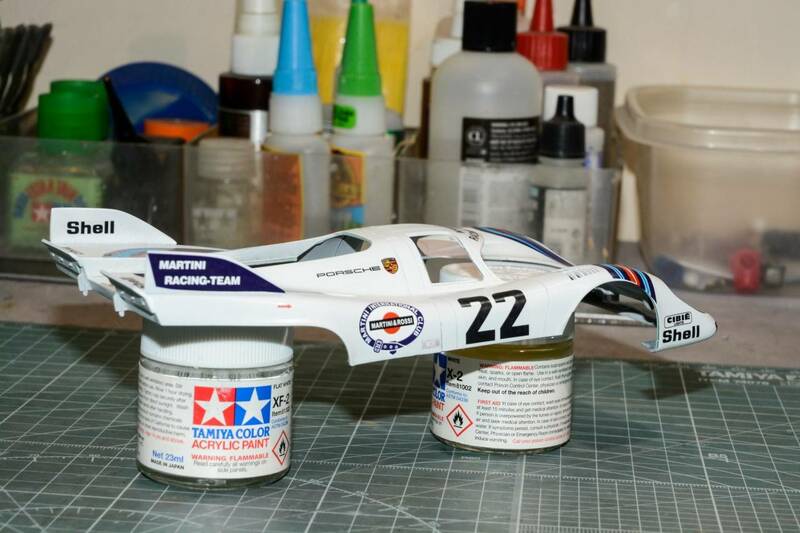 I used Alclad Aqua Gloss Clear which is pretty robust and allows polishing using 3000/4000 grit and certainly help the decals which were very fragile. But I have no experience with cars and your paint looks pretty good so maybe decal, gloss and polish would work. I will be interested to see how it goes for reference. I'm so use to a gloss clearcoat prior to decals from years of Military modeling. The paint is smooth but not glass smooth. while I'm confident that silvering and flash won't be an issue, precise placement of the thin decals could be. Still need to think about it a little more. Thanks for your input, it's much appreciated. I'm still on the fence as which way I'm going to go. Alcad Gloss Clear (Mineral Spirit), Zero Paints Gloss Clear (Lacquer), & MCW Clear (Lacquer). Like I mentioned to Gabriel I've always gloss clear coated my aircraft models to achieve a smoother finish then even polished Matt paint can produce. the few coats of gloss shouldn't be an issue compared to the amount of primer & paint I've already applied. Gotta come to a decision a lot sooner then later, as I need to continue with the body. Best of luck with the decals whatever path you chose! I rubbed out the color coat with Tamiya 3,000 grit sponge till is was smooth, as my gloss painting technique needs a lot of tweaking. It's nothing like painting a military model. Like you, I decided to go the route I've always used with a gloss clearcoat. I used the MCW Gloss as I had it. Let it dry for a day, and rubbed that out. Decaling started yesterday. So far so good. 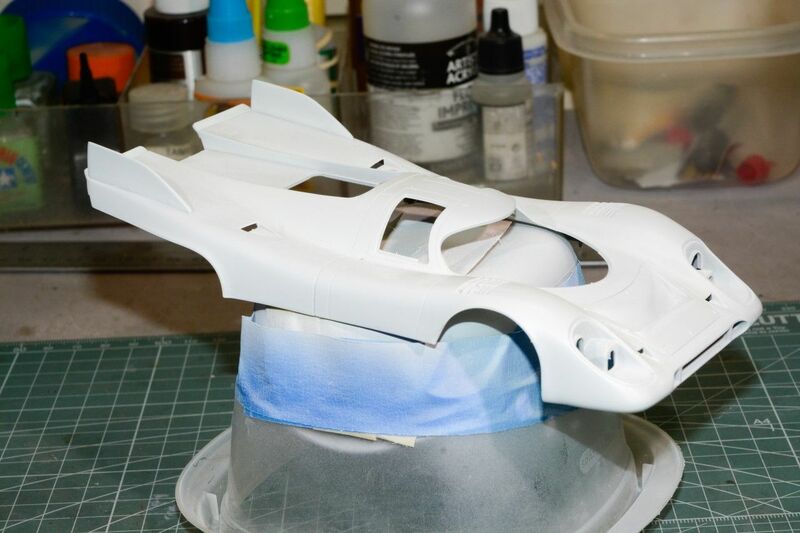 It's going to take several sessions just to complete the decaling process. Then I'll do an update. I've also been doing a little more detailing in the cockpit, but I'm not even sure you'll be able to see any of it once the dash is installed and the cockpit is closed up. I'm still watching the Willstein show - just on a different channel ! boy is it great having you along on my 1st car build. And now I find out that I've got my own channel!! well, I reckon you're almost certain of success with that method. A glossy coat will almost always result in a good decal application, so going with the gloss clear is a good move. Rubbing back the colour between coats is something they do in the automotive trade as well, so I reckon you're onto a winner! Removed by original poster on 07/11/18 - 14:43:47 (GMT). The decaling is going slow as I use my tried & True 3 part system: Microscale Set, then Sol, and finally Solvaset. The system works perfectly with the Indy Cal decals. I just have to keep on reminding myself not to rush each decal so the solutions don't have enough time to do their intended job. I don't mean to rush you up but... any update yet? No rush what's so ever. I just shot the pictures for my next update, which should be up later today. Well, it's time for another update. This time it's almost all about decaling. Gee, what a surprise that is. But 1st I had to deal with the headlight housings. On the 917s they are gloss Black rather then the color of the body. Makes little sense since the bulbs have chrome back reflectors to get as much light on the track as possible considering the speeds that they're doing. So how to best paint them? Air Brush of course. Paint was Tamiya Gloss Black cut 2:3 with Tamiya Yellow cap. Now comes the tough part, how to mask them as the body is already painted. I'm going to leave all the pictures till the end since I forgot to take pictures of the masked shell, and after the painting was finished. I tried to mask the housing with Tamiya Vinyl curveable tape, but it just couldn't make the tighter radiuses. 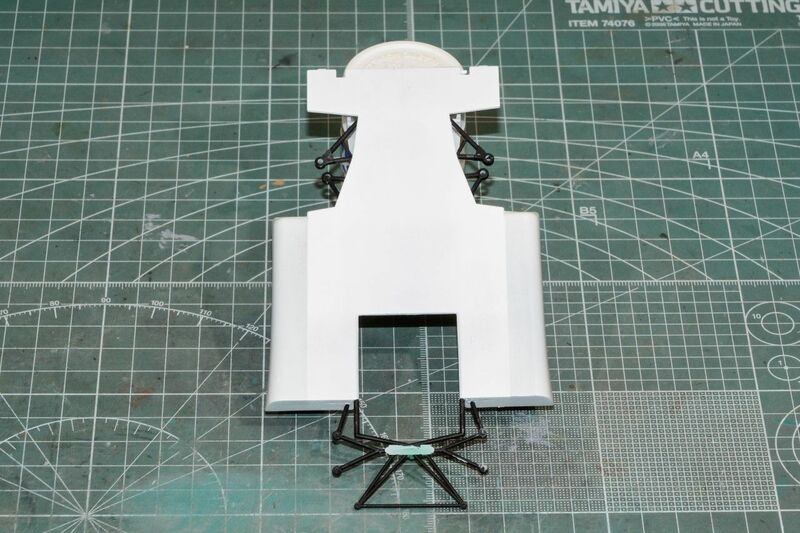 Next up was covering the housing with Tamiya 18mm tape. It just covered the opening. Then I burnished the tape into place with a toothpick along the lip where the clear plastic cover will be attached. Then I carefully cut it out with a brand new #11 Blade. Low and behold, I didn't slip and cut the painted surface for a change. I then carefully masked the nose clip, then covered the rest of the shell with Blue painters tape. Shot the Gloss black, and when I removed all the masking, not a drop made it under the tape. Now there's a 1st for me. I decided after much thought that while the paint is really smooth, I just would feel more comfortable with a clear gloss sealer. So I used the MCW Lacquer Clear Gloss that is pre-thinned a little thicker then water. I AB'd it @ a flow rate of 18 psi, then I gave it a quick polishing the following day with a wet piece of Tamiya 3,000 polishing spunge. Silky smooth. The decals for this build are by Indy Cal. You need to cut out each decal as close to it as possible as the entire sheet is basically one large decal. Using my decal produres of Micro Set, Micro Sol, & Finally Solvaset, every single decal laid down perfectly. They have a Mat finish so a Gloss sealer will be needed. The chassis pan has a composite skid plate to protect it from the constant scrapping on the bumps. The plate is a bright White. So I masked it out and then painted it Mig Ammo Mat White followed by a coat of Dullcoat. 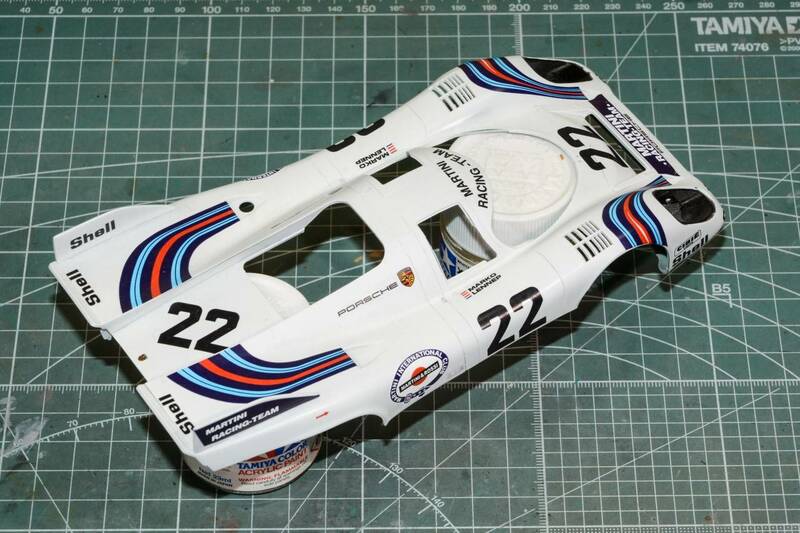 It's so White that the sides of the chassis don't look nearly as white, but that's the perfect match fotr Martini White. I still have to decal both sides of the chassis, but I screwed up one side of the sponsor decals out of shear carelessness. Fortunately, Mike the owner of Indy Cals has this great "Oops plan". He'll replace the damaged decals one time for free. So I'm waiting for the replacements. In the mean time, I have plenty of work to do to keep me quite busy. 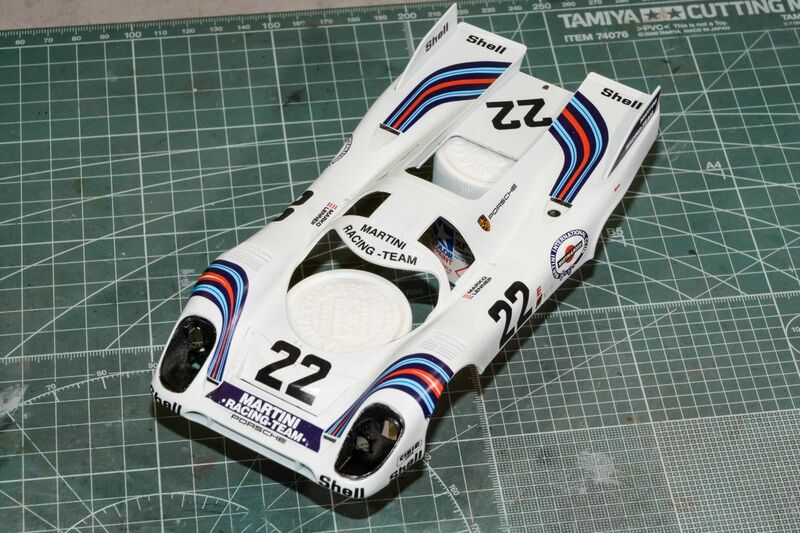 Never mind the mistake the rest looks a stunning effort on those Martini decals over all those Porsche curves. And isn't it always a great feeling when you peel back the tape and your masking hasn't let any bleeding through. Beautiful neat work, Joel. Yes, the technique you described for painting the lights surroundings is quite often employed by the "car guys" that prefer to airbrush everything, especially for dash boards / door cards / rubber seals around windows. It's a pity with the decals, but if the replacement is free and the screw-up doesn't interfere with the main workflow too much, then you're in a lucky spot! Glad to hear that!